These pretty hot pads are worked in continuous rounds to add double protection for your countertops. 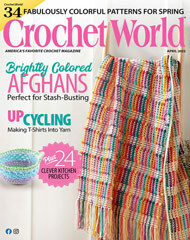 This e-pattern was originally published in Scrap Crochet! Size: 5 1/2" x 5 1/2". Made with medium (worsted) weight cotton yarn.